When poop glows: Luminous waste of the fungus gnat ignites an underground light show in New Zealand, evoking ewws and aahs from visitors. I grab the feet of the person behind me, then swing my own legs onto the inner tube floating in front. Once our entire group is linked, the guide tells us to switch off our head lamps. It takes a minute for my eyes to adjust to the blackness, but once they do, the dark erupts with light. Bright bluish pinpoints cluster into constellations over our heads as we float down the Waitomo River--some 50 feet underground. The specks above are not stars but the glowing excrement of the cannibalistic fungus gnat Arachnocampa luminosa in its larval stage. Unique to New Zealand, and found in dark forested areas and caverns, the insects commonly known as glowworms emit light when their waste products react with oxygen in the air. Call them the original waste-to-energy factories. They send down gossamer threads, so thin as to be almost invisible, that sway gently from the ceiling. Other insects, attracted to the light, get caught in these silky lines. Voila, dinner. Voracious from birth, the glowworm larvae turn into cannibals if other bugs are scarce. Only 10 percent survive to adulthood. Close-up footage of the larvae sucking up their prey is not for the squeamish. But you probably wouldn't have very good table manners either if every meal might be your last. In its adult incarnation, a glowworm has no mouth with which to eat, living only the few days required to mate and reproduce. 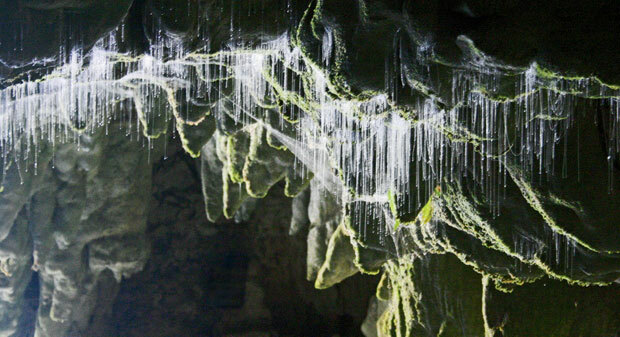 The Waitomo Caves, two hours south of Auckland, are prime glowworm real estate, with flowing water delivering aquatic insects and protective limestone walls keeping those gooey lines from getting tangled in the wind. These caverns, which rose from the ocean floor millions of years ago, have been a tourist draw since 1889, when the local Maori chief Ta-ne Tinorau began escorting guests through by tallow candlelight.